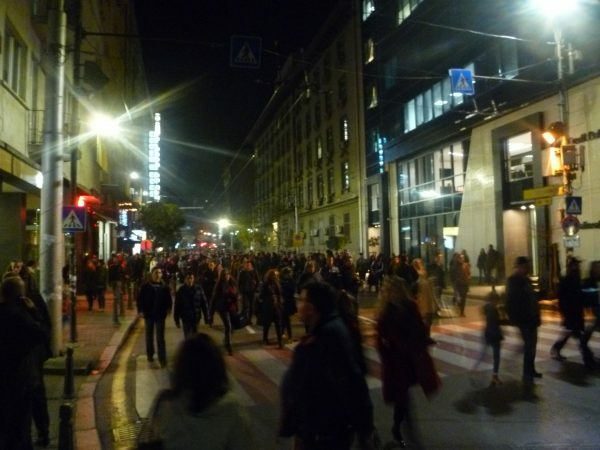 More than 1000 people gathered in the centre of Sofia on the evening of October 26 to demand that Ataka leader Volen Siderov’s immunity from prosecution be removed and to protest against his aggression against students at the National Academy for Theatre and Film Arts. Prominent Bulgarian actors, including Union of Bulgarian Actors chairperson Hristo Mutafchiev, joined in the protest. The protest had been planned to be held in front of the National Assembly building but this was refused. Instead, the initial gathering was next to nearby Alexander Nevsky cathedral, moving on in a procession to the academy building in Rakovski Street. Large numbers of uniformed police were deployed close to the protest and at various points in the centre of the city, with fire engines parked at various points, apparently because of concerns that the protest might come under attack from Siderov’s supporters. Around 7pm, an attempt by a group from the protest to march on Ataka’s headquarters was barred by a large police cordon. In a declaration read at the event, students at the National Academy said, “Siderov is a bad actor, and we do not want to be part of this play”. The October 26 protest was organised after the incidents the previous night and on Friday in which Siderov, accompanied by Ataka MPs and supporters, intruded into the academy building. Prosecutors are seeking parliamentary consent for arrests and prosecution of Siderov and Ataka MP Dessislav Chukolov on charges including hooliganism and intimidation. GERB, Parliament’s largest party, said on October 26 that it would consult other parties on rescinding the constitutional provision giving MPs immunity from prosecution, and limiting immunity only to their participation in plenary sessions of the National Assembly. Support came from other political quarters, including the Reformist Bloc, which said that MPs’ immunity was never meant as a licence to assault and intimidate people.